Today’s modern applications are not restricted to a single platform. Yet, in many ways, mainframe management and administration professionals are still tackling performance issues and problem resolution using the same methods they did when mainframe applications were all COBOL and never strayed off of the centralized mainframe computing platform. And this causes many problems. The IT infrastructure of most organizations is multi-tiered, and business transactions flow through multiple systems and services to deliver business value. This means that today’s applications can utilize the most appropriate and useful technology for each component, thereby delivering more functional and easier to use transactions. Development time can be faster, too. So far, so good… but performance management and problem resolution become difficult challenges in this brave new world. A business application that relies upon multiple differing computing platforms, technologies, and components to deliver service is characterized by its complexity. Consider an application where users deploy Windows workstations running .NET applications that connect to Linux servers running Oracle and stored procedures that connect to the mainframe to access DB2 data. Such an infrastructure consists of a lot of connecting points to stitch together significantly differing hardware and software platforms. And what happens if there is a problem? Tracking down the root cause of the problem can be difficult. The mainframe DBAs usually have a performance monitor for DB2 and the systems programmers have a monitor for CICS and z/OS. And the distributed DBAs and system administrators have their monitors, too, for Oracle, SQL Server, Linux, Unix and so on. So let’s assume that this multi-tier application begins exhibiting poor performance. Where do you start? You can’t fix what you can’t see, so unless the problem is easily monitored within an individual silo, discovering what is wrong and fixing the issue becomes a lengthy, troublesome, and expensive task. The problem could be anywhere, so it’s a major undertaking to pinpoint the root cause. To the mainframe professionals the application goes into a “black hole” when it leaves the mainframe; to the distributed computing professionals, it is just the other way around with the mainframe being the “black hole.” Even with visibility into some components of the application, at some point the transactions vanish into one of the black holes. A siloed approach to managing performance just does not work when the application spans multiple silos. What is needed is an application performance management solution. Organizations must be able to track business transactions from end to end; that is, from the time the user makes a request all through the entire infrastructure required to provide an answer and right back to the end user. Such a tracking solution must be able to follow the transaction in real time and report on the resources consumed at each point along the way. By providing real-time monitoring of each transaction flowing end-to-end across distributed applications it becomes possible to see the problem, to identify its root cause, to determine performance issues, and to solve problems more rapidly and less expensively. Think about it. What are the applications and transactions like at your organization these days? How many can satisfy business needs completely on a single platform? Have you ever tried to resolve an issue or identify the root cause of a problem for an application that spans multiple platforms? When did the trail become cold because the transaction disappeared? And how did you move past all the finger-pointing? Compuware’s latest offering, APM for Mainframe, delivers end to end transaction management so that the mainframe is no longer a black hole. Using this solution you can track your distributed applications across every platform, find the root causes of problems and performance issues, and resolve them on the spot. Without such a solution you just have to keep living with the pain. And that means unresponsive distributed applications, slower time to correct problems, lost revenue, and higher administrative costs. Just a short blog post today to let everybody know that I will be doing a book signing for the new edition of both of my books at the 2012 Information on Demand conference on Tuesday, October 23rd. 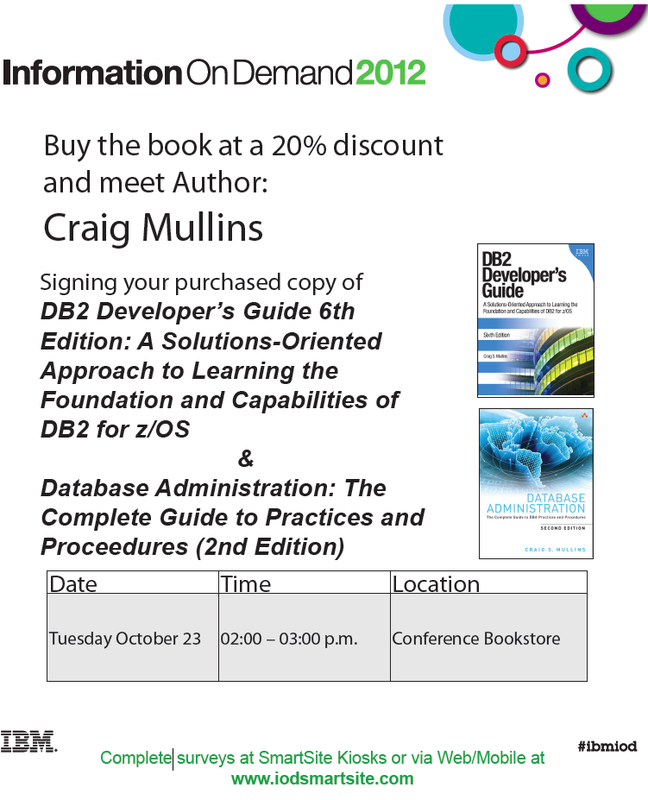 You can choose to have me sign the new 6th edition of my DB2 book, DB2 Developer's Guide... or the new 2nd edition of my DBA book, Database Administration: The Complete Guide to DBA Practices and Procedures. Or you can be my favorite type of person and choose to get them both signed! DB2 11 for z/OS: Coming Soon! 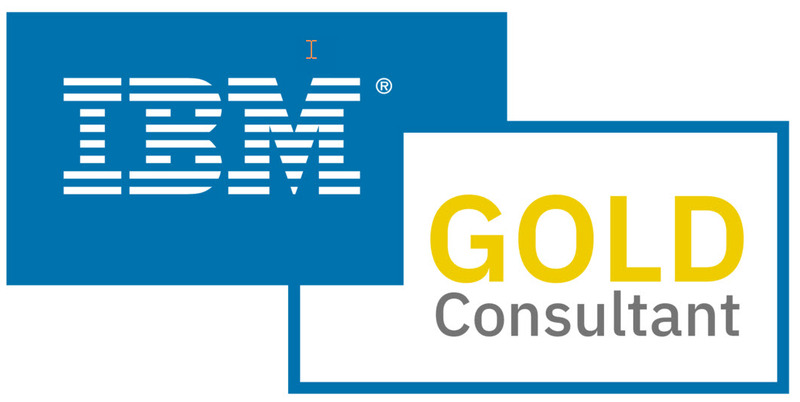 Today, October 3, 2012, IBM announced the Early Support Program for the next version of DB2. Heretofore code-named Sequoia, the DB2 11 ESP is planned for March 8, 2013 availability. So if you are still lagging behind running DB2 9 (or, heaven forbid, DB2 V8) now is the time to get yourself to DB2 10 so you'll be ready for the imminent onslaught of DB2 11 for z/OS. One of the more intriguing tidbits is the new SQL PL ARRAY support. IBM is claiming this feature may be able to offer up to 10 percent CPU savings for OLTP workloads with high read-to-write ratios. So get ready for DB2 11 - I'm sure we'll hear more about it at the IOD conference, coming up at the end of the month.